Collages and medleys are filled with bright colors and eye-catching detail. They're an excellent way to fill the space on a tea towel, tote, pillow, placemat, or shirt. These new designs give spring a warm welcome. 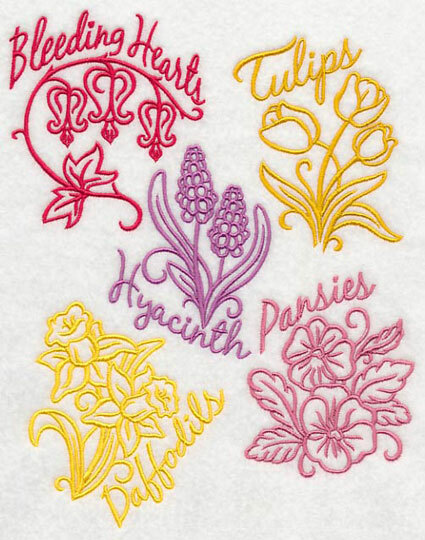 Bright flowers, fluttering butterflies, gardening birds, and many more themes are ready for your stitching pleasure. Add a breath of fresh air to your garments and home decor with these designs! Scroll down the page to see the variety. The designs are available in several sizes. 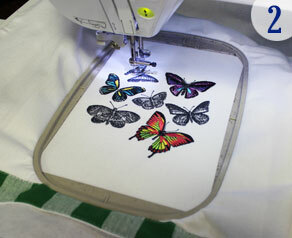 Be sure to consider your machine's embroidery area when selecting designs. on tea towels, totes, and shirts! 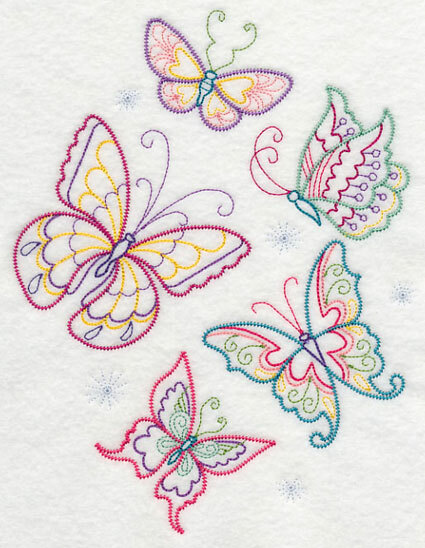 Dainty and elegant butterflies are ready to land on tea towels, table runners, quilt blocks, and wall hangings. 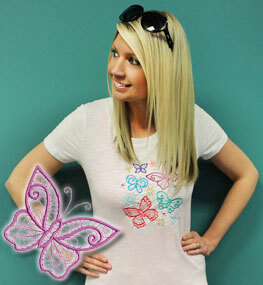 These butterflies with delicate floral embellishments are light and open. 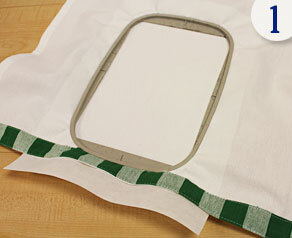 They're a perfect fit for smooth, neutral fabrics - such as quilter's cotton, linen, tea towels, denim, and duck cloth. 6.83" x 7.80" and 5.86" x 6.69" and 4.89" x 5.58"
Portions of the above collage are also available as individual designs. 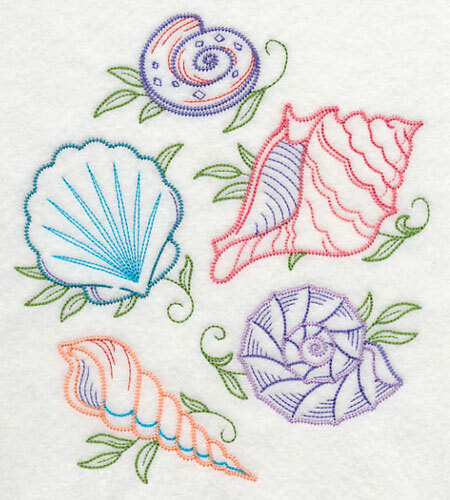 Use them in conjunction with the larger design shown above, or on their own to dress up skirts, shirts, and table linens. Gardening birds are digging in the dirt! 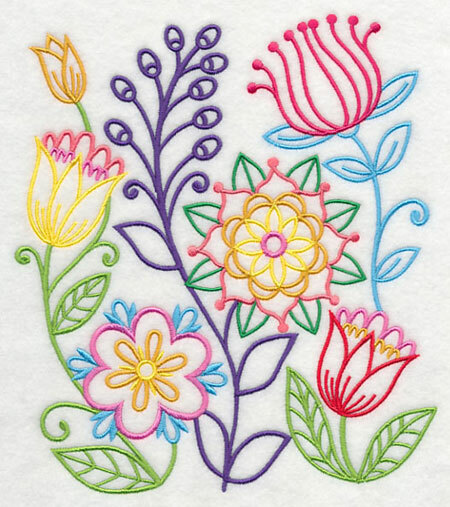 This design is in a vintage style: light, open, reminiscent of hand embroidery. Add it to tea towels, gardening totes, mini-quilts, and wall hangings. 6.85" x 10.29" and 5.85" x 8.79" and 5.21" x 7.83" and 4.57" x 6.87"
The birds from the above collage are also available as individual designs. Use them in conjunction with the larger design above, or on their own. They're adorable on shirts, skirts, table linens, and dish towels. 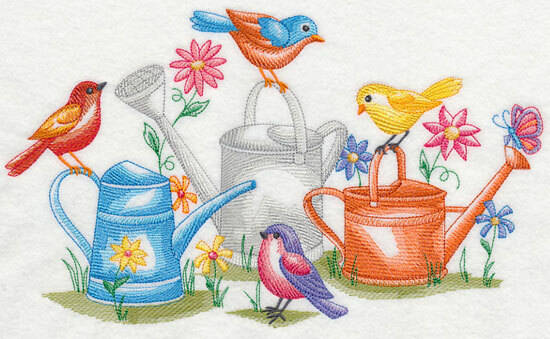 A trio of watering cans are surrounded by colorful flowers and birds. This design is light and sheer; an excellent choice for smooth, neutral fabrics. 11.63" x 6.88" and 9.38" x 5.56" and 7.82" x 4.62" and 6.86" x 4.06"
Light and sheer designs are excellent choices for smooth and neutral fabrics. We embroidered the design onto an off-white linen, and made a pillow cover. 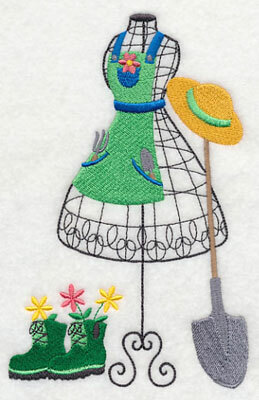 If it's too early to play in the dirt and work in the garden, plant beautiful designs on garments and home decor items! Use the colors that we provide on the color change sheets, or choose your own to match your own decor and personal preference. 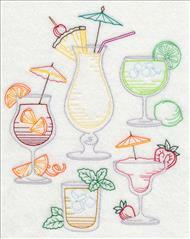 Sketch-style designs use light stitches in varying densities to create depth and dimension. 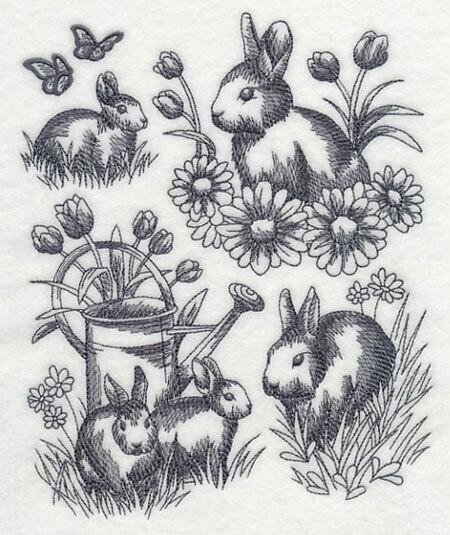 In this design, rabbits pose in spring grass, flowers, and with butterflies. Dress up tea towels for Easter with this design! 6.45" x 7.80" and 5.84" x 7.05" and 4.85" x 5.86"
Portions of the above collage have been separated and are available for individual purchase. Use them in conjunction with the larger design above, or on their own in other projects. 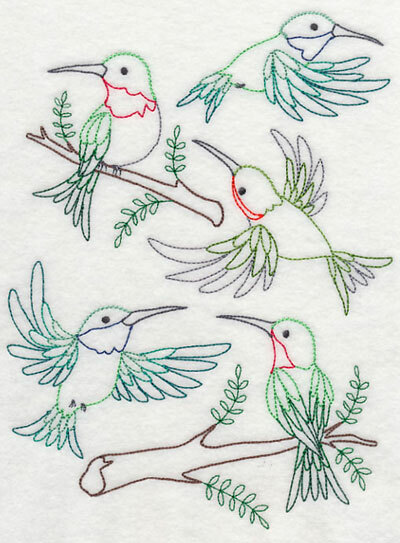 Hummingbirds zoom and zip their way onto tea towels, tote bags, and pillow covers. This collage design is in a vintage style; it is light and open, reminiscent of hand embroidery work. 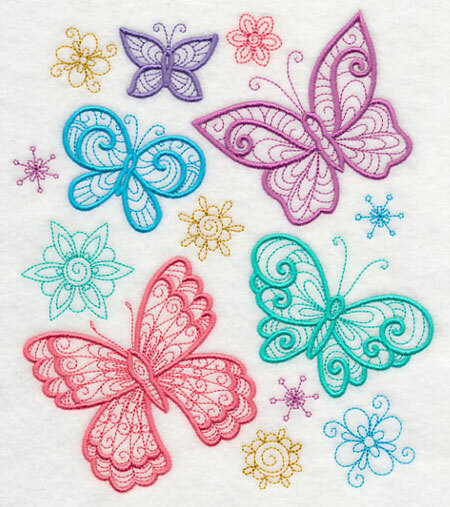 6.85" x 9.28" and 5.78" x 7.83" and 4.84" x 6.56"
Delicate and colorful butterflies will flutter their way onto pillowcases, tea towels, and table linens. Change the colors in the wings to coordinate with your favorite fabric and personal preference. 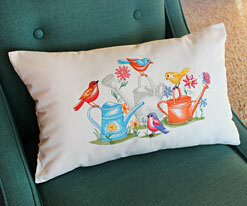 6.90" x 8.91" and 5.88" x 7.60" and 4.87" x 6.29"
Plant a garden of colorful flowers onto pillows and tea towels! The square shape in this design is a lovely way to fill the space. Collages and medleys are big and bright on craft bags, book bags, and grocery totes. We planted the above floral medley on a tote, and it adds so much color and interest. 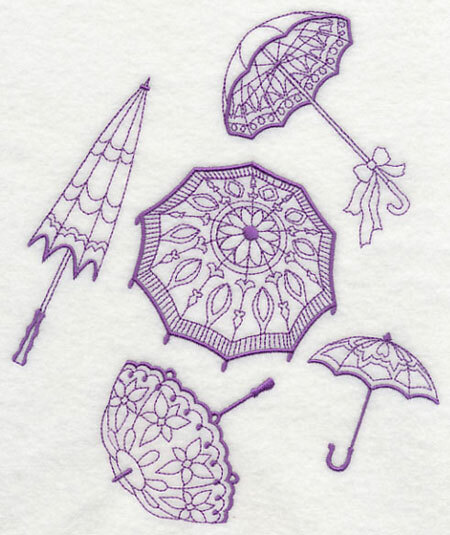 Delicate parasols add an elegant look to quilt blocks, totes, and pillows. 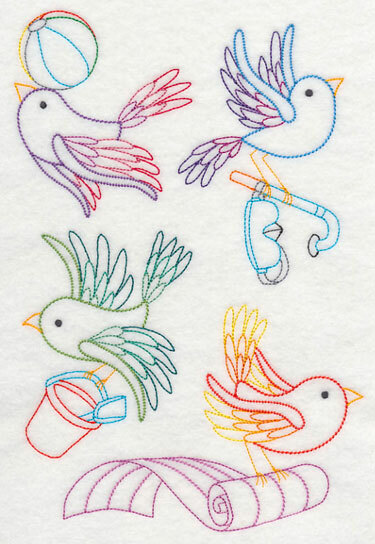 This design uses just one color thread, making it quick to stitch onto your projects. 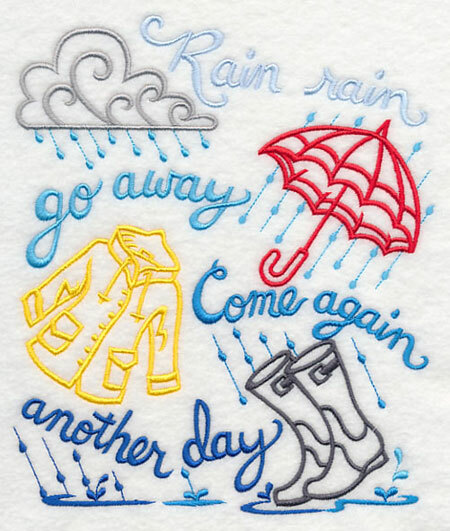 6.53" x 7.80" and 5.86" x 6.99" and 4.85" x 5.79"
A popular children's rhyme, with rainy-day elements! This design is sweet on quilts, and wall hangings for the nursery, too. 6.62" x 7.80" and 5.86" x 6.91" and 4.86" x 5.73"
Spring flowers bloom and grow from placemats, table runners, tea towels, and more! This design features five colorful spring flowers arranged in an eye-catching collage. 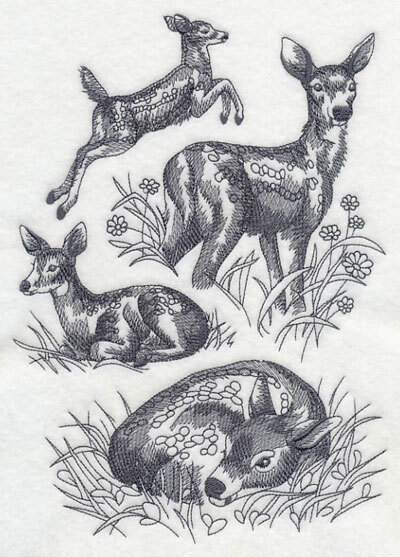 6.91" x 8.57" and 6.30" x 7.81" and 5.86" x 7.27" and 4.85" x 6.01"
A young spring deer jumps, rests, and watches, ever alert. 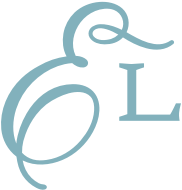 This design is in a sketch style; it's light and open. Choose smooth, neutral fabrics (no busy prints) for excellent results. 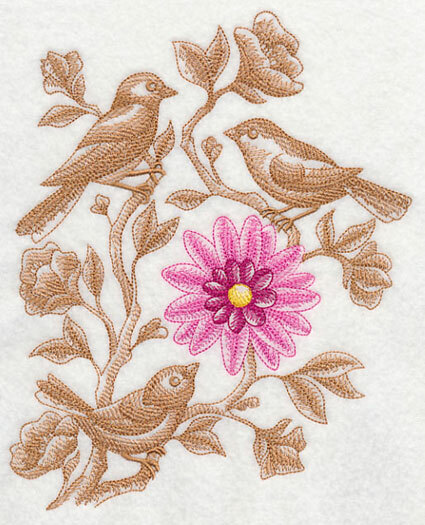 6.90" x 9.71" and 5.54" x 7.79" and 4.85" x 6.83"
Light-stitching toile birds and branches are embroidered in brown. A bright pink and yellow flower is gorgeous against the monochrome birds! This design is a lovely addition to table linens, nature quilts, and tote bags. 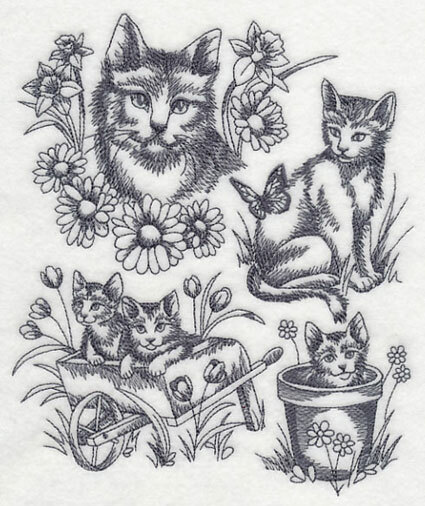 6.90" x 8.45" and 6.36" x 7.80" and 5.83" x 7.15" and 4.85" x 5.94"
Sketch-style cats are light and lively additions to pillows and totes. This design features four mini-scenes arranged together in one collage. 6.55" x 7.80" and 5.85" x 6.97" and 4.85" x 5.78"
The mini-scenes from the above design have been separated and are available for individual purchase. Use them in conjunction with the larger design above, or on their own in other projects. 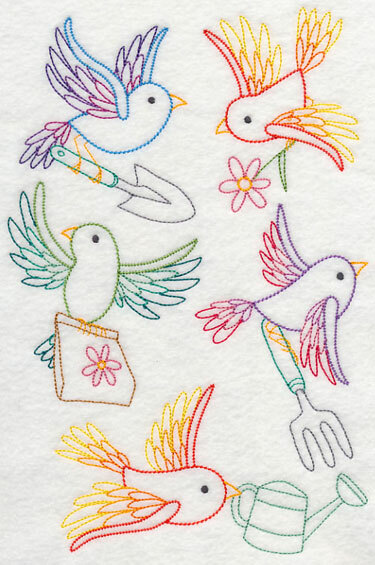 These little birds are ready for the beach! One carries a beach ball, another snorkeling gear. One is ready to dig in the sand and build a castle, while the other carries a beach towel. The design is light and open, and is best on smooth fabrics. 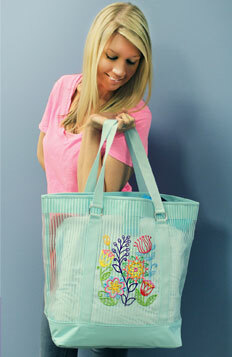 Add it to canvas beach bags for a delightful look! 6.85" x 10.33" and 5.86" x 8.83" and 5.20" x 7.83" and 4.55" x 6.85"
Single birds from the above design have been separated and are available for individual purchase. Use them in conjunction with the larger design above, or on their own in other projects. If you're dreaming of walks on the beach, and trips to the shore, then these seashells are a perfect fit! 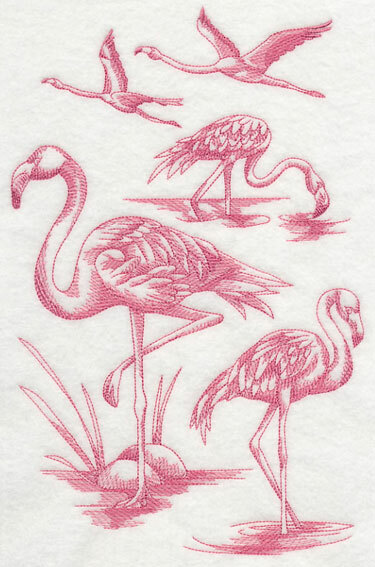 Add them to tea towels for the kitchen, and linen towels for the bath. The designs are light and open in a classic vintage style, and are excellent on smooth fabrics. 6.90" x 7.78" and 5.85" x 6.60" and 4.84" x 5.45"
6.90" x 8.53" and 6.32" x 7.81" and 5.85" x 7.24" and 4.85" x 6.00"
Are you ready for fun in the sun? 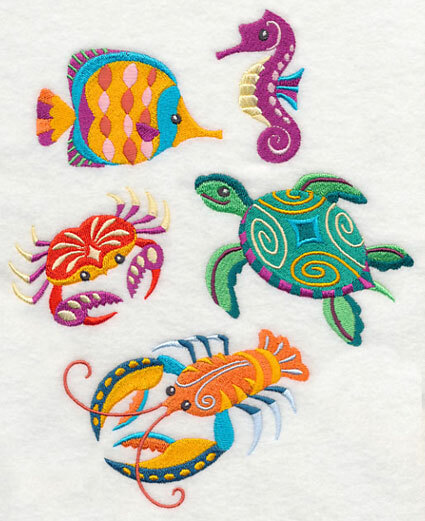 Dress up beach towels and totes with sea-themed designs, and you'll bring a touch of the tropics wherever you go. Find many patterns and tutorials for tote bags on our Projects page here. 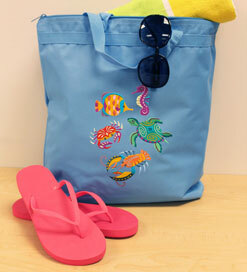 Add a sunny look to canvas beach bags and after-swim wraps! 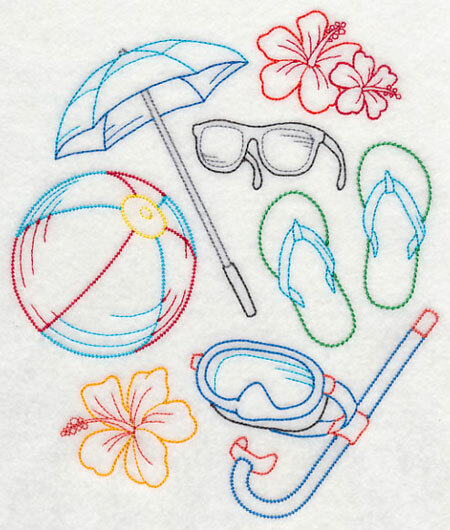 Colorful tropical and beach vacation icons are arranged together in this collage. 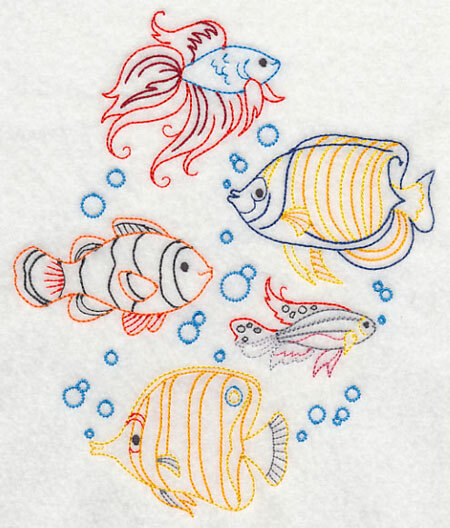 6.67" x 7.83" and 5.87" x 6.89" and 4.86" x 5.71"
Tropical fish, in a light-and-lively vintage style, is dreamy on tea towels. 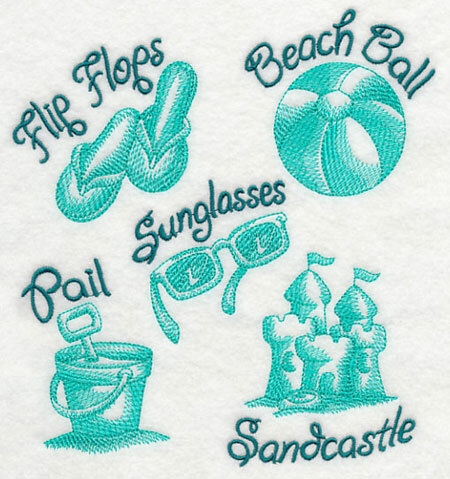 Dress up placemats and aprons for your beachfront getaway! 6.52" x 7.80" and 5.85" x 7.00" and 4.85" x 5.80"
Add a tasty and delicious look to aprons, patio placemats, and bar towels with this design! A variety of drinks, ranging from lemonade to iced coffee, add summer flair to poolside projects. 6.91" x 8.64" and 6.24" x 7.80" and 5.88" x 7.34" and 4.86" x 6.06"
The drinks from the above collage have been separated and are available for individual purchase. 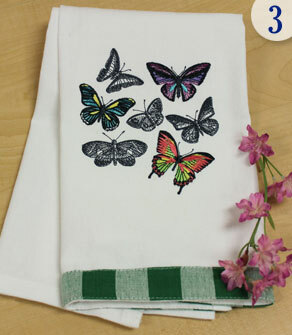 Use them in conjunction with the larger design above, or on their own in other projects (like matching linen napkins!). 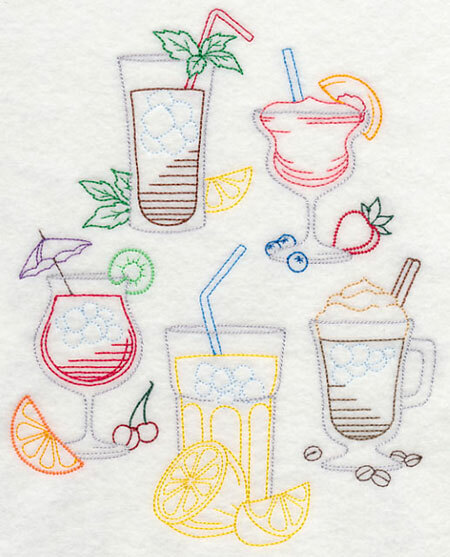 This medley features a variety of alcoholic drinks, such as a daiquiri, pina colada, margarita, sangria, and mint julep. This was created in a vintage style, so the stitches are light. It's an excellent choice for linen bar towels, aprons, and tea towels. 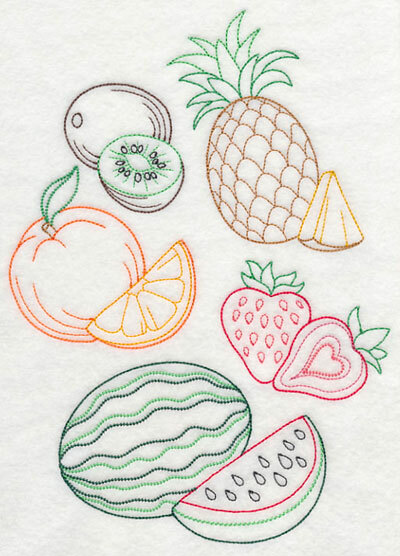 6.91" x 8.71" and 6.20" x 7.81" and 5.86" x 7.38" and 4.85" x 6.10"
Add a fresh and fruity look to tea towels and placemats! Brighten up kitchen decor with this healthy and good-for-you design. 6.85" x 9.60" and 5.58" x 7.83" and 4.85" x 6.79"
Birds of a feather are flocking together in this vintage-style design! 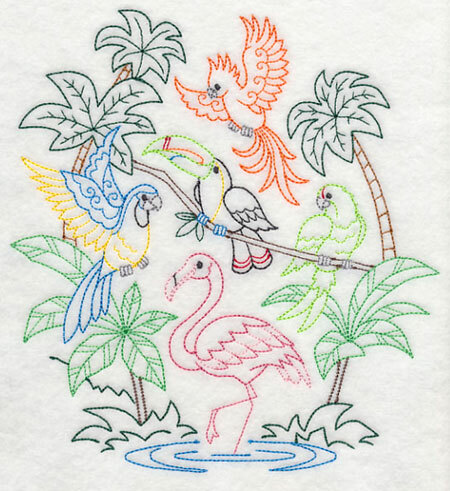 Flamingo, toucan, macaw, and parrots, bring a lively look to towels and totes. 7.31" x 7.83" and 6.85" x 7.33" and 5.85" x 6.26" and 4.85" x 5.19"
Sketch-style designs are light and open. This design uses one color thread, but creates depth and dimension with stitch density. Portions of the design are open, and the background fabric will show through. Choose smooth, neutral fabrics for excellent results. 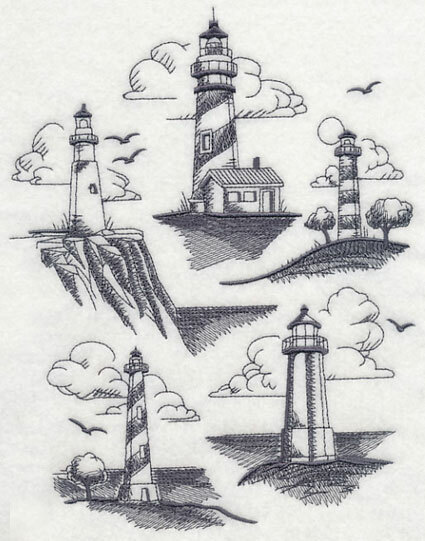 6.90" x 10.71" and 5.85" x 9.08" and 5.02" x 7.79" and 4.42" x 6.86"
This design features a quintet of lighthouses, in an easy-breezy sketch style. Add these gorgeous structures to tote bags, pillows, and table linens. 6.90" x 8.85" and 5.85" x 7.51" and 4.85" x 6.24"
Quick-stitching toile designs are light and bright on quilter's cotton, linen, denim, and canvas. Toile designs have open areas, so choose smooth fabrics (nothing with a nap, like terrycloth). 6.91" x 7.34" and 5.86" x 6.22" and 4.87" x 5.17"
Add sweet stitches to aprons, tea towels, placemats, and wall hangings for the kitchen! These cupcakes are light and open in a vintage style. 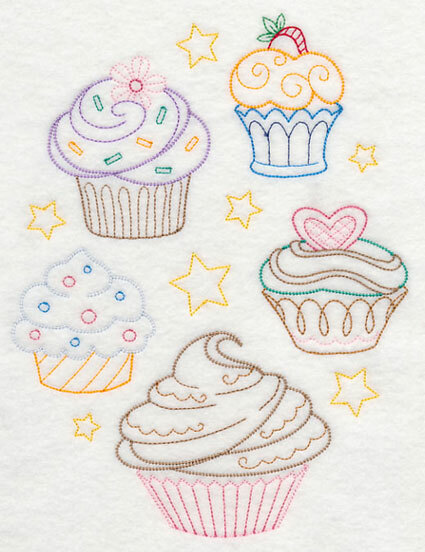 They're quick to stitch, with flavorful effect. 6.86" x 8.99" and 5.87" x 7.70" and 4.86" x 6.36"
Colorful teddy bears bring sweet smiles to burp cloths, baby quilts, onesies, and t-shirts! 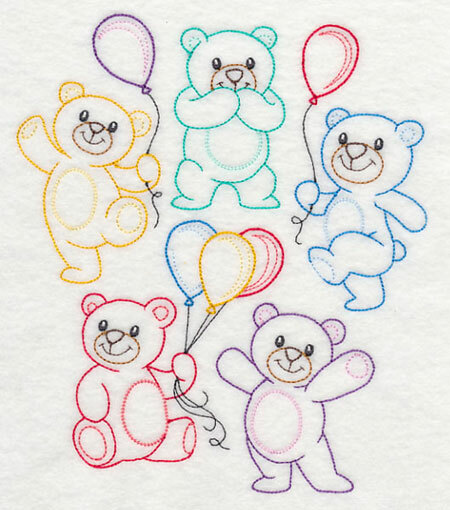 A quintet of bears are dancing, giggling, and holding colorful balloons. 6.82" x 7.83" and 5.85" x 6.72" and 4.85" x 5.57"
Spring brings frogs, toads - and toadstools! 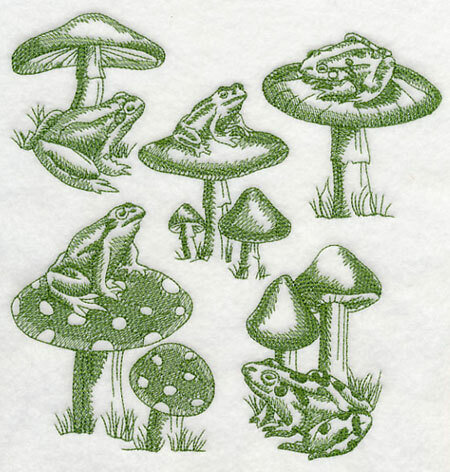 This light-and-lively toile design features toads with their stools, enjoying a sunny spring day. Add to tea towels, tote bags, and more! 7.57" x 7.80" and 6.90" x 7.10" and 5.85" x 6.03" and 4.85" x 5.00"
Toads and stools from the above collage have been separated and are available for individual purchase. Use them in conjunction with the larger design above, or on their own in other projects. Add country charm to placemats, aprons, tea towels, and curtains, with these designs! 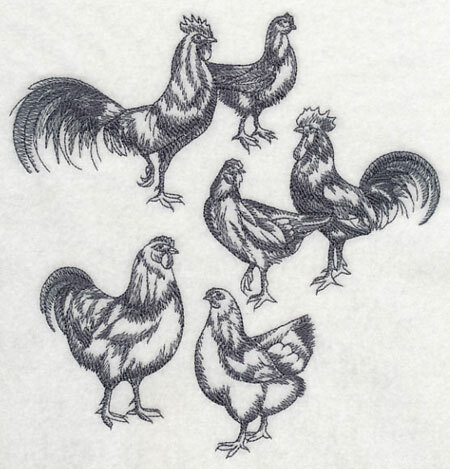 Pairs of roosters and hens, digitized in a light sketch style, are an excellent way to shake your tail feathers, and strut your stuff. 7.56" x 7.78" and 6.89" x 7.08" and 5.86" x 6.02" and 4.86" x 4.99"
Hen and rooster pairs from the above collage have been separated, and are available for individual purchase. Use them in conjunction with the larger design above, or on their own in other projects. 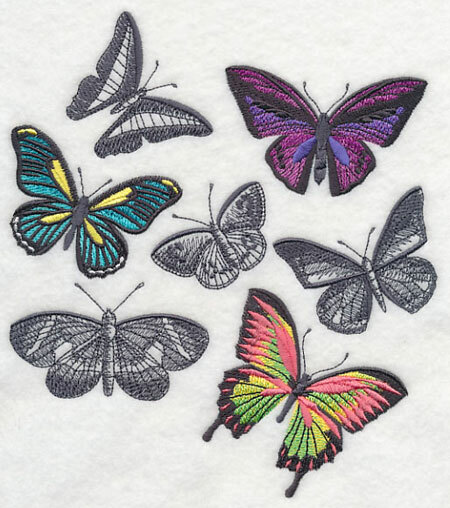 Some of the butterflies are in grayscale; others are in full color. The blend is beautiful! Add to tote bags, tea towels, aprons, and placemats. 6.90" x 7.70" and 5.86" x 6.54" and 4.88" x 5.45"
Dress up a tea towel with these tips! Choose a good-quality tea towel. We find tea towels at Target, Home Goods TJ Maxx, and Kohl's. Online sources include Amazon, Joann's (Aunt Martha's brand), and All About Blanks. The towel that we used in this example is from All About Blanks. Pre-wash the towel. Hoop it with a piece of medium-weight (2.5 or 3 oz) cutaway stabilizer. Use a 75/11 or size 11 sharp sewing needle, or an embroidery needle. A sewing needle has a finer/smaller point, so it will leave smaller perforations in the fabric. Trim the stabilizer away from the back. Leave 1/2 inch around the entire design (no need to cut between the sections of the design). Remember to hoop the towel with cutaway stabilizer, and you'll get excellent results! Mary Pat loves adding the dress form designs to her projects, and asked for two new themes: gardening, and rockabilly. Oh what fun! The gardening dress form has boots, and little flowers are blooming from them. 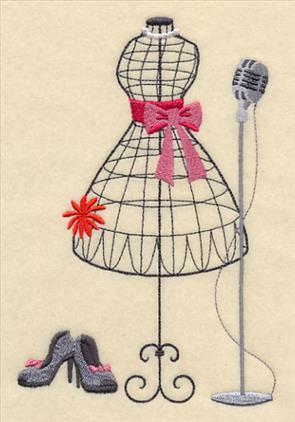 The rockabilly dress form has a microphone and delicate fashionable elements for fun. Thank you, Mary Pat, for the suggestion! 6.90" x 10.74" and 5.85" x 9.11"
5.02" x 7.81" and 4.41" x 6.86"
6.90" x 10.45" and 5.85" x 8.87"
5.15" x 7.81" and 4.52" x 6.86"
About the Request of the Week program: Each week we draw and digitize designs based on customer requests. It's called the "Request of the Week" program. The most recent additions are shown above, and you can find many others grouped together on this page here. If you have an idea for a new design, let us know! The Request of the Week Program is a popular one, and designs are scheduled through the middle of 2016. But we still want to read your ideas! Send them to support@emblibrary.com. We'll add them to the list of designs to be created!